How do I replace starting striker switch on a tall patio heater? How do I clean out carbon build up in the pilot feed tube? 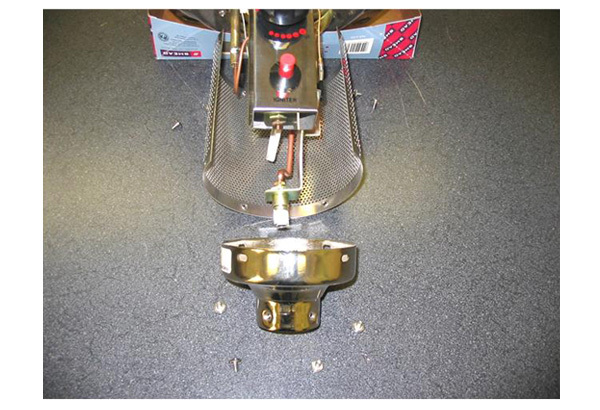 How do I adjust pilot on portable table top and replace anti tilt on tall heater? How do I adjust the pilot feed tube on tall heaters? 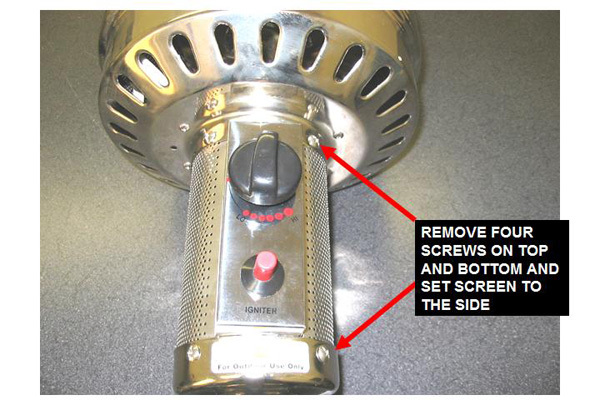 Where do I find Patio Heater Manuals? 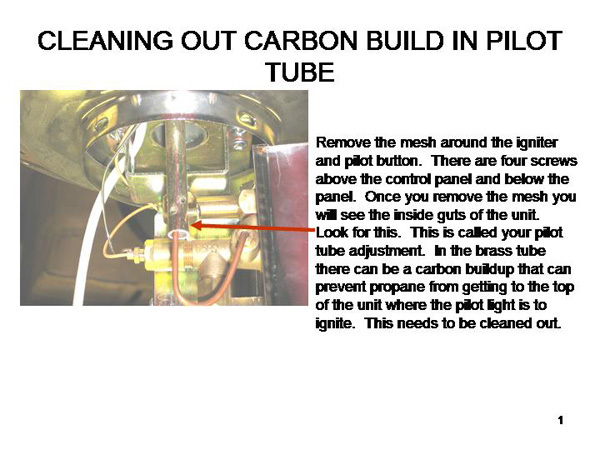 Why won't my pilot light? Why does my propane bottle and regulator freeze up on my table top heater when using the 16oz cylinders? 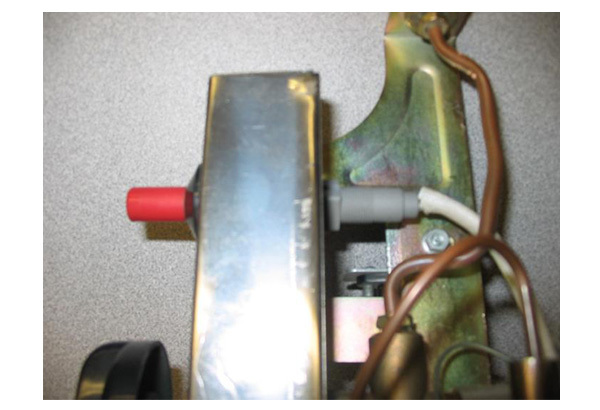 Why does my pilot light, but goes out when heater is turned on high or low? Why does my unit burn low or won't stay ignited? 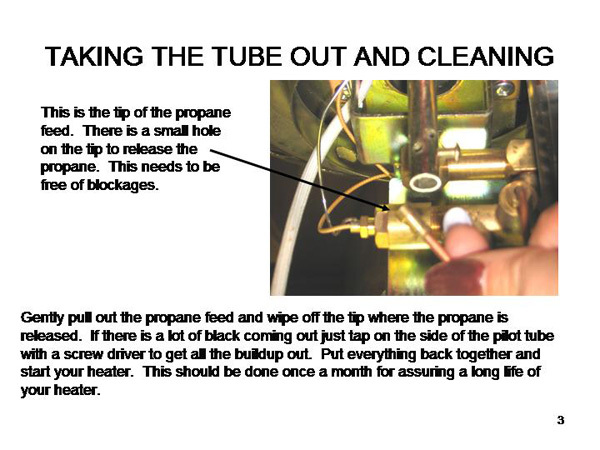 Should I smell propane when starting my heater? 1. How do I replace starting striker switch on a tall patio heater? 2. How do I clean out carbon build up in the pilot feed tube? 3. 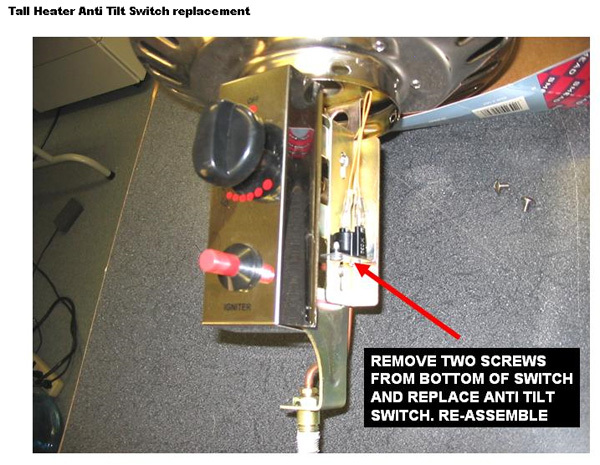 How do I adjust pilot on portable table top and replace anti tilt on tall heater? 4. How do I adjust the pilot feed tube on tall heaters? 5. Where do I find Patio Heater Manuals? 6. Can I convert my LP gas patio heater into a natural gas patio heater? Can I purchase an adapter that will allow me to use a larger cylinder for my portable table top heater? You can purchase a 5' adapter hose that works off of a 20 lb propane tank from our web site or mass merchant. 7. 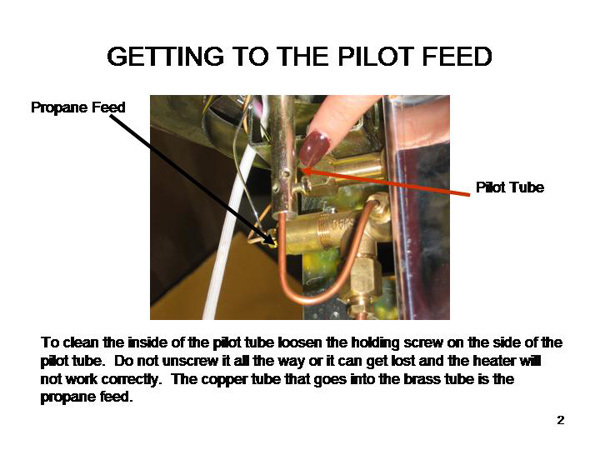 Why won't my pilot light? Blockage in venturi tube that houses the pilot feed tube (very common for spiders to build webs which will block venturi feed tube. 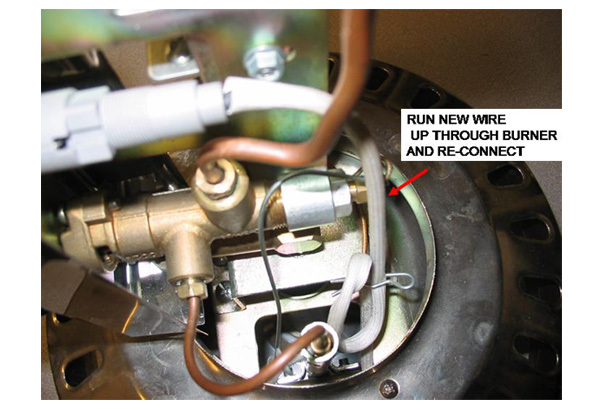 Burnt sentiment from pilot light will also block venturi tube (back out pilot feed tube and use pipe cleaner to remove debris. Use compressed air if possible to thoroughly clean. Propane tank empty or not open. 8. Why is my burner flame low? 9. Why does my propane bottle and regulator freeze up on my table top heater when using the 16oz cylinders? Very common problem with 16 oz disposable tanks. 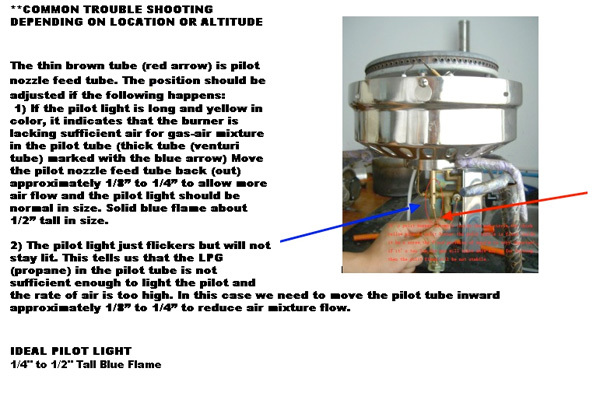 (When problem occurs reduce volume setting to allow propane to flow evenly to burner). You can purchase an 5' adapter hose that will convert your heater to 20 lb propane tank which will eliminate this problem. 10. 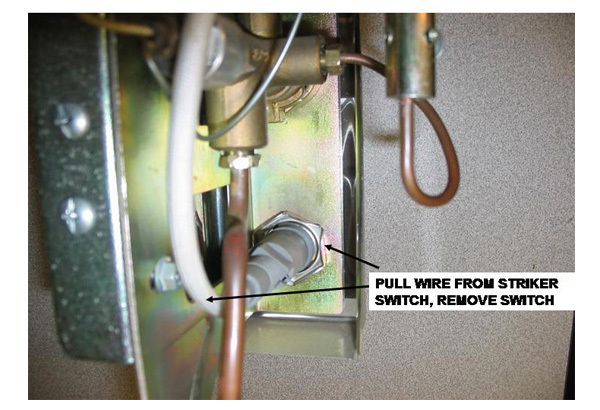 Why does my pilot light, but goes out when heater is turned on high or low? 11. Why do I get a yellow flame and black smoke? 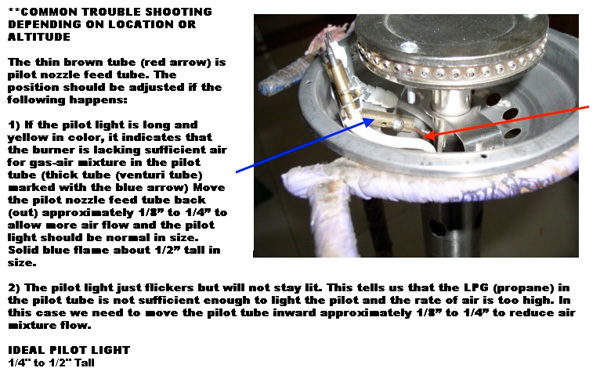 Possible blockage in the burner venturi tube which houses your pilot feed tube. 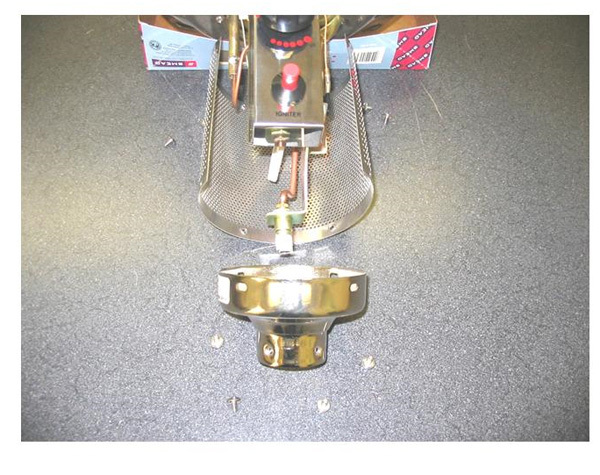 Clean the venturi tube buy backing out your pilot feed tube for access. Use pipe cleaner to remove all debris. Use compressed air when possible to remove all particles. 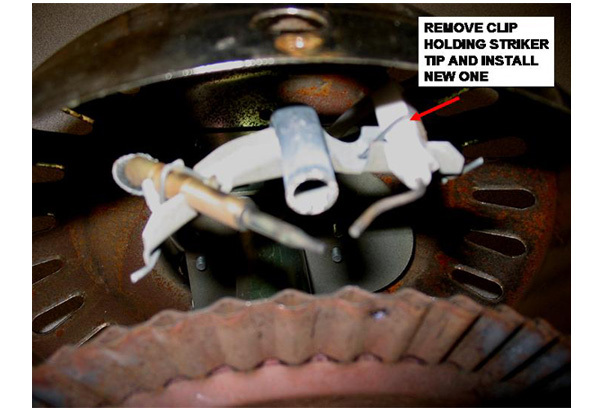 A minor adjustment to your pilot tube setting may also remove this condition. 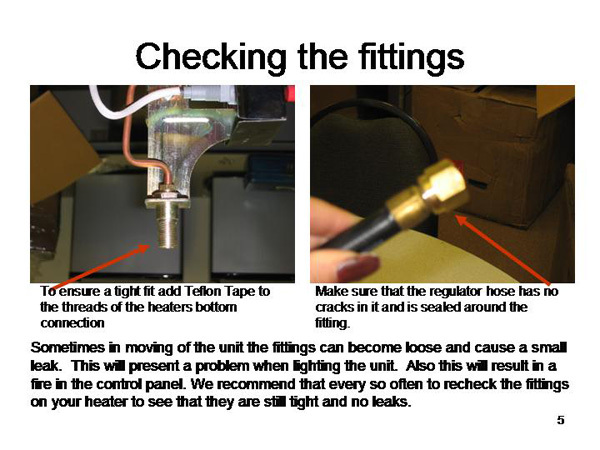 Pilot light should be no larger than 1/4 to 1/2 inches tall for proper operation. Unit should be cleaned ever year. 12. Why does my unit burn low or won't stay ignited? Propane temperature needs to be above 40 degrees F. Propane will freeze at or below 40 degrees F and will not perform properly. Solution: Wrap propane bottle with a towel or blanket or relocate temporarily to area where temperature is above 40 degree’s F.
13. Why does my unit burn low or won't stay ignited? No!! Our heaters are designed to operate based on a lit pilot light which emits a very low pressure which generally is detected if all fittings are tight and sealed. (Not typical to a gas barbeque or other propane gas appliances).